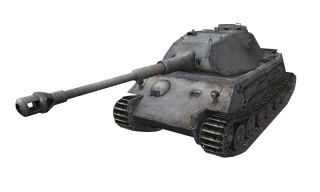 Der VK 45.02 (P) Ausf. 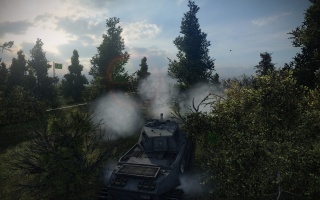 A ist ein deutscher schwerer Panzer der Stufe 8. Ein Projekt zur Weiterentwicklung des VK 45.01 (P). Der Prototyp wurde nie gebaut, da der Zehnzylinder-Porschemotor die Versuchsphase nicht bestand. Die gebauten Türme wurden bei den ersten Tiger II verwendet. 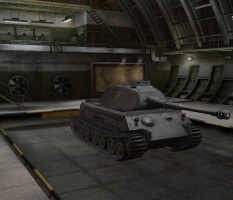 This tank has weaker guns and thinner armour than the Tiger II, but has slightly better mobility. Its armour is well sloped but pretty thin . The most noticeable differences from its brother, the VK 45.02(P) Ausf. 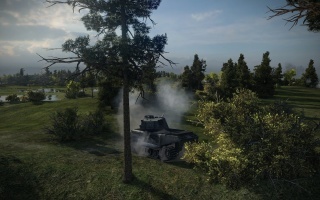 B, is that the Ausf. 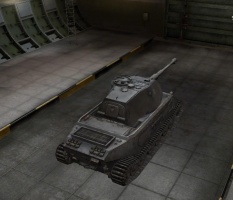 A's turret is mounted at the front instead of at the back, that the Ausf. A is much nimbler, and that the Ausf A. has weaker armour and gun selection. 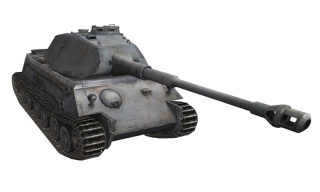 Der VK 45.02 (P) Ausf. A führt zum VK 45.02 (P) Ausf. B. Poor armor, easily penetrated even by most low tiers. Has the same matchmaking weight as on opposing IS3, while standing no chance against it. 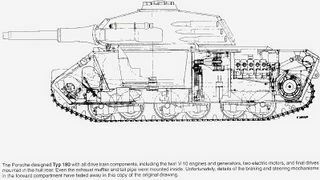 The 8,8cm KwK 43 L/71 gun, the 2x Porsche Typ 100/3 engine, and the FuG 12 radio all carry over from the Tiger P; however the upgraded suspension is needed in order to mount all three. 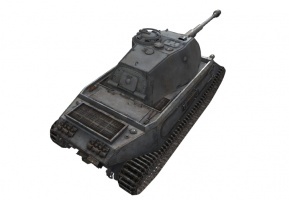 After researching the upgraded suspension, either the 10,5cm KwK 45 L/52 gun or the upgraded turret may be mounted depending on whether you want the additional armour or the increase in damage first. Typ 180A: Electric drive with Porsche Typ 101/3 gasoline engines. Typ 180B: Electric drive with Porsche Typ 101/4 gasoline engines. Typ 181A: Voith II hydraulic drive with Porsche Typ 101/3 gasoline engines. Typ 181B: Voith II hydraulic drive with Porsche Deutz Typ 180/1 diesel engines. Typ 181C: Voith II hydraulic drive with Porsche Deutz Typ 180/2 diesel engines. A new turret for the VK 4502 (P) had to be developed after it was determined that the 8.8cm Flak 41 could not be installed in the VK 4501 (P) turret. Records appear to indicate that the design was finalized by May 7, 1942, because Krupp reported difficulties shaping the turret's specially rounded front. The rounded front reduced the frontal target area, and thus it would not present the shot-trap that became apparent in the initial production design of the Henschel Tiger II. The rounded front of the turret would then line up with the sloped frontal armor (albeit only on the chassis with the front-mounted turret). Initially an order for 200 complete VK 4502 (P) tanks was authorized in April of 1942, with the first four to be delivered in October. Unfortunately, Dr. Porsche's fascination with advanced (and unproven) engine design doomed the project when the 10-cylinder engines he designed for the tank failed during trials. Given that Dr. Porsche's previous failures used engines with the same drive train layout, the Wehrmacht had no confidence he would succeed in making it into a dependable engine. As a result, all contracts relating to the VK 4502 (P) were rescinded in November of 1942. Porsche nevertheless continued working on the design up to the summer of 1944. By then, the design had a hydraulic drive, a suspension, and a working 900 metric horsepower air-cooled diesel engine. 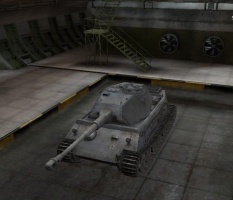 Ultimately, only the turret was used as an upgrade for the existing Henschel Tiger II design. 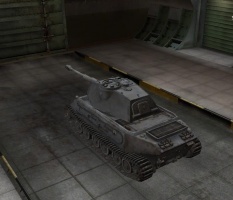 There are no historical records of a 'VK 45.02 (P) Ausf. A Schwerer Turm' turret. One of the VK 45.02 (P)'s historical armaments, the 8,8 cm Flak 41 L/74 (the Pz.Sfl. IVc's top gun), is missing. There is no indication that the 8,8 cm Kw.K. 36 L/56 or 10,5 cm Kw.K. L/52 guns were to have ever been fitted to either of the VK 45.02 (P) projects. Frontal armor is actually much thinner than the in-game version, measuring only 80 mm on the upper glacis. Diese Seite wurde zuletzt am 25. Oktober 2016 um 13:50 Uhr geändert.